Well Friends, the first week has passed since embarking on my new and improved, healthier and active lifestyle. I definitely had some hangry moments and a few I might keel over episodes, but overall it was what I would deem a success. Here are just a few highlights from the week. Tricks I learned: Instead of pop (including diet), I am drinking flavored water with caffeine for my daily boost. Like this Mio Energy. Also, eat lots of ice. Couch to 5K days completed: Three for a total of 4.57 miles. Days over 10,000 steps: Two. However... there were three that were so close. Little victories: We attended a birthday cookout after church on Sunday and I did eat a lot of the scrumptious food that was prepared, but I kept my portion sizes within check. I've had lots of water compared to my normal intake. On the days I didn't have time to pack my lunch, I had Subway. I tried to walk for 15-20 minutes on non-Couch to 5K days. Regrets: I made brownies Saturday evening and I had two when I really should have only had one. After I ate the second, I knew it was too much. Next week goals: Reach 10,000 steps on more days. Steer clear of all pop. Complete Week 2 of the Couch to 5K. Is this something you want to see each week? Or does another person's weight loss journey in a blog seem redundant and old news? You tell me. On to Week 2! 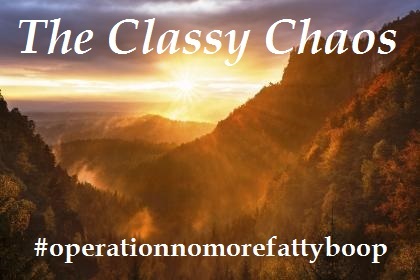 I would love for you to join me on IG or just follow along - #operationnomorefattyboop! I vote keep going. I am in the middle of trying to lose weight as well except I don't have a real plan and have also seen basically no success. Seeing you do so well makes me want to come up with an actual plan! Is there a couch to 5k plan somewhere I can reference? Congrats on your weight loss! That's awesome! I have five more pounds to reach my goal! We can do this! I love following along! You've got this girl! Share away. You do well and will be a total inspiration to whoever is in the battle with you! Hey I love the progress and great for losing 4 1/2 pounds this week. I hate when I want all the brownies or cookies and I have too much. We all do it, so please don't beat yourself up about it. YOu have done really well this week!! Congrats!! !